I haven’t written much about gardening around here, because honestly the last few years we haven’t been able to yield too much from ours. This year we did things a little differently and had much better results. The thing is, you really have to know what to plant to get the most value out of your home garden especially if your garden is urban and can’t fit a lot of crops. Our garden is about 10′ x 2′ so we have very few choices of what to plant there. This year, health being a top priority and having to buy more produce as a result, we chose things that are costly to buy at the store, but are fairly easy to grow at home. If our garden produced anything at all, it would at least defer a little of the cost we already spend on this produce at the grocery store. Foremost for me is the ease of growth. If the crop is easy to grow, I will enjoy growing it and not get frustrated. This will keep me planting the crop year after year, and get me the biggest saving. Gardening is not therapeutic for me like some find it and if I get frustrated early with difficult crops, not only will I have wasted money on the crops that die, I probably won’t try the garden again the following years. Strawberries – Strawberries are expensive in the grocery store, and they are really easy to grow at home so they are a prime crop for a tiny little garden. You can even make use of indoor potted planters to grow strawberries, they’re that easy. This year our strawberry plants grew well and yielded about a dozen little strawberries. The strawberries were really sweet and very easy to grow; we just had to water them once a day. 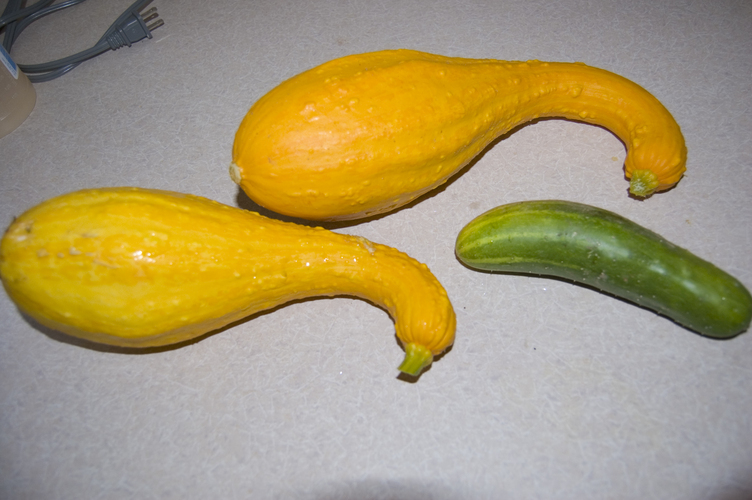 Squash – This one is a bit trickier because a single plant can yield half a dozen squash and if you let a single squash get too big, the others will all die. The trick is to pick the squash when they are just big enough, so the others continue to flourish. After you pick some squash, new blossoms may come in and you could have a few batches of this crop throughout the season. Radishes – My wife hates these, but they do really well in poor soil and grow to full size in just a few weeks. Green beans – These freeze well and if planted at the right time of year, after all frosts have come and gone, they grow really well and usually in big numbers. Peppers – Although these are an easy crop, we managed to kill them this year. They usually do really well and you can pick them at different times of the season to get different colors. The other main factor that helps us decide what goes into our tiny garden is the yield. If we are going to spend time tending the garden, the crop must produce enough to be worth our time. The strawberries were a bit of a disappointment this year, but as years go by, those plants should produce more. To get the most bang for our buck and time, we need some plants that just overflow the tiny garden with produce. Zucchini – We didn’t plant this this year, but will do so next year. You may hear stories from others about Zucchini taking over the garden, and they are all true. Zucchini has a very high yield and we often see it on the roadside for sale by the crate. Asparagus – This is pretty high yield and very expensive to buy in store so it’s a great choice, but it is not the easiest as it takes about three years to start really producing. Green beans – On both the easy and high yield list, these should be a first in any garden. You can pick these during season and they will keep producing. Blueberries – These also take some time to establish, and you will need a little more space for them, but they continue to produce plenty of berries year after year. Carrots – These are fairly easy and they taste great fresh out of the ground. They are also very versatile as you can eat them row, or use them to cook with. You can grow over a dozen carrots in a single square foot of earth. We planted cauliflower and celery, both deemed difficult for the inexperienced gardener and small garden. The celery died on us, and the cauliflower has yet to produce a bud. We failed to pick our squash before it sucked all the nutrition from the other buds so we got two big squash so far, though new buds have begun to grow. We planted everything at the same time, which may not be ideal for some of our crops. Many people garden for therapy, but for us it’s the money saved and flavor of fresh fruits and veggies that prompt us to get down with mother nature. Do you garden? How does your garden grow? I'd add tomatoes to your list too–they are really easy to grow (in my area–not sure where you are) and they keep on giving too. Also, if you choose the cherry/grape tomato variety–you will yield tons, more than you know what to do with actually. And you can successfully grow them in deep containers if you don't have alot of space. One last plus–they taste so much better than what you'll find in the store. I had a failed attempt at a garden earlier this year. But I'm hoping to move out soon and maybe establish a nice garden in the next year or two. Other great way to get good veggies is to support a CSA (community supported agriculture) project. I LOVE the idea of a CSA. There isn't one in our neighborhood, but my in-laws church that owns a large lot of land started one there. It's such a great idea and really gets people involved with each other and the community. Good luck with the move and hopefully the new garden! Chief, Watermelon is the way to go. We grew one last year (before we had a real baby) and it felt like one of our children. We'd check on it SEVERAL times a day to see if it had grown. When it was time to finally pick it, we didn't want to eat it because it was like a member of the family :). mmMMMmm, Watermelon is so tasty when it's fresh, and I have never actually had it THIS fresh 🙂 though eating a child doesn't quite sound as appetizing.. How many Watermelon grow on a single plant I wonder? We actually had 3 on one plant (but two had to be sent back to foster care). It spreads out like a vine so you need a fair amount of space, although we did ours in a bucket…..it just kinda took over and spread all around into neighboring plants. Ah, well we will definitely be trying Watermelon next year..I actually dreamt about Watermelon in our garden last night..how weird! Car Coach on Is Auto Assure a Scam? Car Coach on Amazon Prime Review – Is It For You?